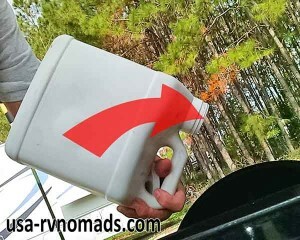 For almost the first year of our RV travels we had only a portable gas grill along. That was fine for grilling hamburgers, brats, or steaks, but we missed the capabilities of our Weber kettle grill. When we returned to our storage unit last summer, the first item pulled out was our charcoal grill. Sure, it takes up a lot more space than the tiny portable gas grill, but to us, it’s worth it. We grill whole chickens, turkey, the occasional steak, and typically fill up most of the surface with all the trimmings. There’s no easier way to prepare an impromptu meal for ourselves or guests, especially without heating up the kitchen. We used it for Thanksgiving and we’ll use it again for Christmas dinner with friends. 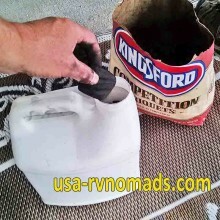 In addition to finding space on board for the grill, charcoal storage can be a challenge for the full-time RVer. Most charcoal comes in a paper bag which over time absorbs moisture as does the charcoal. One solution to storing and keeping it dry is easy if you or your neighbor has a cat. Cat litter and many of the dry pet foods come in plastic jugs with large mouth openings. These are perfect for protecting charcoal, as well as wood chips used for smoking meats. It’s simple: Just transfer the contents from the bag into the jug, use a disposable glove or some tongs to do the transfer if you don’t want to get your hands dirty. The charcoal will pour out as needed with a simple shake of the jug. When pouring, have the opening to the top (see picture), this will keep the briquettes from getting jammed up inside the opening. If you need something bigger, try recycling a cat litter pail. And there you have it: easy, free, charcoal storage. What’s your grilling preference – gas or charcoal?